The American Girl Doll is a perfect example of the need for beautifully knitted, crocheted and sewn clothing. 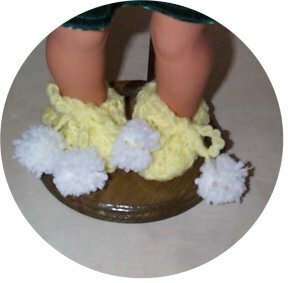 Hand knitting doll clothes for profit is an avenue you may want to consider. If you like to knit doll clothes the American Girl Doll is a great beginning. Here we will cover some more items you can create for building your inventory. Your niche could be doll clothes alone and be very successful. 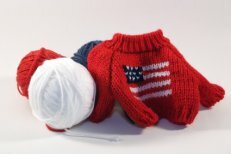 You can find some free simple knitting patterns and than use these for ideas of your own patterns. Get ideas from these patterns, create you own but DO NOT copy them. You can get some very creative ideas from these patterns but never copy the pattern because that is copyright infringement. You must create new patterns for your business. Looking at the many American Girl Doll patterns can get you to brainstorming for your own creations. 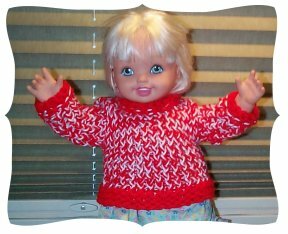 The American Girl Doll knit patterns and clothes are always a big hit at craft shows and bazaars. They are small enough to make up fairly quickly, easy to transport and very attractive to display. These items sell very well. Creating hand knitting for the antique doll patterns and the Cabbage Patch Doll are also requested orders. There are not a lot of patterns for these clothes so if you can make up patterns, you would have a nice sale item. I make American Girl clothing for these dolls and design patterns. But I admit most of my knitting is on the looms or machines. I am very slow when it comes to hand knitting. I am much too slow at hand knitting to get any amount of inventory made up so it is on the knitting machine I made my products. 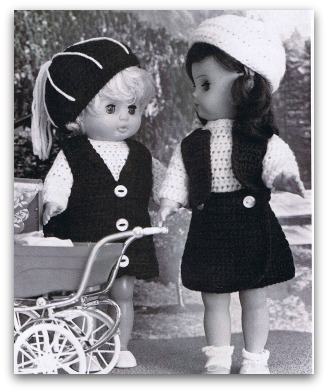 But many do hand knit and crochet their doll clothes. My skill with hand knitting is so very average. But it does come in handy for finishing up items sometimes. I only really hand knit for family or myself. As far as selling the products I hand knit, I just don’t have the speed or talent for that. It is best to know and acknowledge our shortcomings so we can work around them. I have seen a lot of beautiful handwork, from knitters that can produce these hand knitted items. I have a good friend Sharon, she is so good at hand knitting she will take whatever project she is working on, to the movies. You will see her knitting away while watching the movie. I on the other hand have to pay close attention to each and every knitted stitch I make. I can watch TV and crochet, as I don’t have to watch every crochet stitch that I do. But when it comes to hand knitting, I have to pay close attention. So Sharon can use her hand knitting for profit, she also crochets so that can be added to her inventory items. And of course we don’t want to forget the fashion dolls or Barbie dolls. I admit I do not make these items, have never had an interest in them. But you are not me, so this may be just your cup of tea. I have seen the hand made items for fashion dolls selling at Bazaars and such. So this is another option if you enjoy it. Also a nice thing about knitting items for the fashion dolls are you can use up all the odds and ends of yarn you have. We always have lots of yarn balls around that are just too small to do anything with. A Barbie sweater, hat or skirt will use up these odd amounts.